Bones found in Carmel graves 13,000 years old are clearly remains of ritual meals, not offerings or just trash tossed from the cave. Prehistoric men living in the Carmel caves 13,000 to 12,000 years ago didn't just toss their dead down the mountainside. They buried them and held wakes, archaeologists have discovered. The proof is evidence of communal meals attended by dozens of people right by ancient graves in Raqefet, a Carmel Mountain cave some 20 kilometers southeast of Haifa. 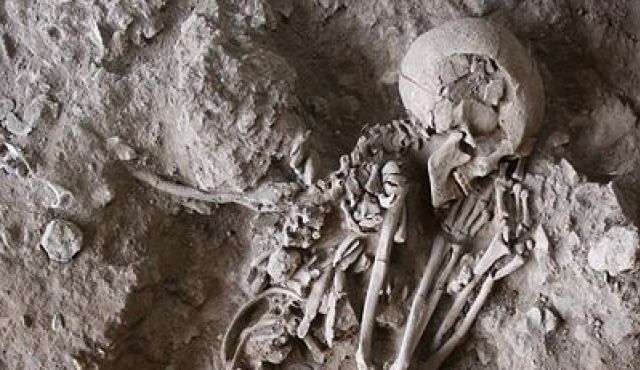 Archaeologists discovered an ancient burial site with 29 skeletons of babies, children and adults interred over more than a thousand years inside the cave. The graves date from 13,700 to 11,700 years ago. The site, excavated between 2004 and 2011, belongs to the Natufian civilization which existed in the Levant between15,000 and 11,500 years ago. 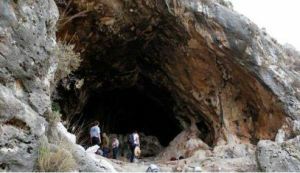 This particular cave was excavated by Prof. Dani Nadel of Haifa University in collaboration with researchers from the Weizmann Institute and colleagues from France, Hungary and the United States. The project was funded by several grants, including one from the National Geographic Society. The new findings were reported by Dr. Reuven Yeshurun, Prof. Guy Bar-Oz and Prof. Nadel in the latest issue of the Journal of Anthropological Archaeology. The evidence for these burial meals was thousands of animal bones that had been laid in graves together with the interred human bodies. The bones belonged to a wide range of animals, including birds, tortoises, gazelles and wild boars, say Yeshurun and Bar-Oz. Smaller mammalian bones were also found, including those of the common hare and of stone martens – apparently ancient man did eat shrews and the like. The bones bear markings of butchery using flint tools, as well as blunt blows using hammer-stones, used to extract bone marrow, according to Yeshurun. This strongly indicates the bones are the remains of meals. The Natufian culture is named for the Natuf creek 15 kilometers northeast of the Israeli city of Lod, which is the first location in which their remains were first discovered. The Natufians are believed to be among the first groups of humans to abandon the nomadic way of life and to settle in permanent locations. Some believe they were the first humans to cultivate cereals. They were also among the first groups known to establish graveyards - defined spaces in which they buried their dead for many generations. Such burial sites were usually placed in entrance chambers of caves or in terraces directly below them. Earlier civilizations used to bury their dead in random locations, if at all. The researchers rejected the hypothesis that the bones were merely rubbish scattered by earlier dwellers in these caves, and that later inhabitants used the same pits for burial. Yeshurun, who studied the cave as part of his doctoral thesis, explains that Natufians did not throw out garbage. Bones left over from meals would be ground underfoot inside the dwelling, shattered by trampling, or burnt when fires were lit. All Natufian settlements contain such burnt or broken bones which derive not from slaughter or cooking, but from later destruction, he says. However, the bones found at Raqefet cave are less burnt and shattered than those found at other Natufian settlements. In addition, the cave has no signs of dwelling – it was apparently only used for burial. Another hypothesis was that these bones are of animals that were laid in the graves as offerings. The researchers rejected this as well, since it was customary to use whole animal body parts as burial offerings, such as a bird wing or a mammalian shank, placed beside the dead person in order to accompany him or her on their last journey. The graves in this cave had no whole bones or bones lying in an orderly configuration, except one gazelle bone and a boar jaw found in one burial pit. This left a third hypothesis, namely that the bones were placed in the graves not for ritual or hygienic reasons, but for symbolic and social reasons. “The untypical and meticulous gathering of the leftover bones indicates that it had some significance after the meal was over, possibly of stashing it with the deceased," says Yeshurun. He notes that the Natufians were living through a period of great transitions in lifestyle. They existed on the cusp of an agricultural lifestyle and the domestication of animals and plants. They were still hunter-gatherers like their ancestors, but were already starting to build small permanent settlements. Each village had up to several hundred inhabitants, and they needed to be inventive in order to feed everyone. Although not producing food yet, they needed to be creative in order to foster social cohesion. Feasting at wakes, with the apparent participation of the entire group, may have been an expression of such attempts to foster this cohesion.